TRIPLE SIX is a five episode audio production starring Joe Stevens of True Grit, Texas Chainsaw Massacre: The Next Generation and Elmore Leonard’s Justified. A Texas businessman and his spirited wife head for Las Vegas to rekindle their relationship. An underworld element kidnaps the wife and forces the husband to play twisted games to win her back. Riley and Brynn Banks head to Vegas for fun in the sun, but their romantic plans fall away when Brynn vanishes. 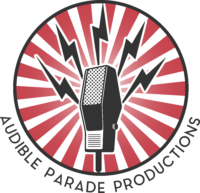 Audible Parade Productions creates audio stories for today. Our productions are much more than audiobooks. We make movies for your mind. Storytelling through sound design.